MUMAC Opened to the public in 2012, offers visitors the perfect opportunity to take a long walk through the history of Italian industry. 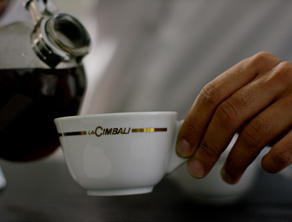 But these are also the steps of a company, Gruppo Cimbali, that has played an important role in this market. Multi-media and multi-sensory, the evocative experience of MUMAC makes it a contemporary exhibition whilst still retaining the accuracy of a historical journey. A journey through different periods, via the six rooms displaying the machines, history, design, technology, and industrial and social development of each age. MUMAC is the ideal place for getting to know the history and technology of espresso coffee machines, but also for understanding the coffee culture (thanks to tastings), organising cultural events, and testing out unique experiences.